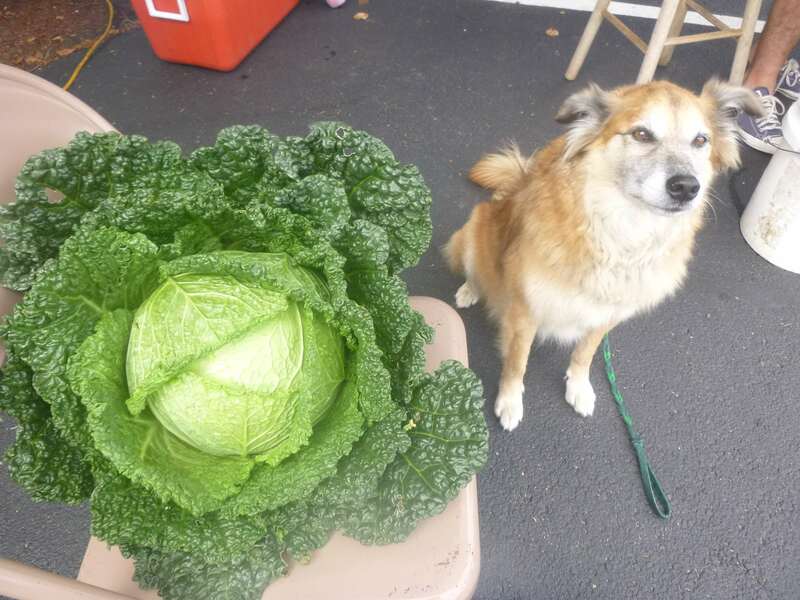 Dog and Cabbage show | Can I Bring the Dog? Chico and I went to the Tamworth farmer’s market on Saturday to schmooze and shop. I was quite taken with a cabbage the cheese man had purchased to take home. Is that a lovely cabbage or what? Next we had a stop at the store. We encountered a little pack of local kids, ages about seven to about ten, out on their own, ranging free in our little downtown, with some money to spend at the penny candy counter. A couple of them know Chico and asked if he’d do some tricks for their friends. “Do High Five, do High Five,” said Wesley. So we did. Then the kids wanted a turn doing High Five with Chico. And he was willing to do it with four of them. It’s always big when he’ll interact with kids, it’s always big when he’ll do tricks for someone else. Add the two together and you get about four times the degree of difficulty – Chico is a hero! And of course, I’m so busy managing the kids, supporting the dog, and staying out of the way of other customers, I got no time to take a picture of it. So take my word for it, OK? It really happened. This entry was posted in Uncategorized and tagged dog at farmers market, dog with kids. Bookmark the permalink.